This word scooped from the annals of zoology demonstrates the descriptive nature of many Chinese words. For the student learning Chinese vocabulary, it provides a word that can nail down the two characters in the word. My experience has been that a word like this is not soon forgotten and that, although its utility as a word is limited, it is useful in learning the language. These are two characters that you probably won't see too often and if and when you do, it'll probably be this word from biochemistry. A nitrogen-containing, single-ring, basic compound that occurs in nucleotides of DNA and RNA. The purines in DNA and RNA are adenine and guanine. auf Deutsch - Verbindungen, die in den Zellen aller Lebewesen vorkommen. Sie spielen eine Schl�sselrolle bei der Erbinformation. Das Endprodukt beim Abbau der Purine ist die Harns�ure. Bei Gicht ist der Harns�uregehalt im Blut erh�ht, deshalb m�ssen purinreiche Nahrungsmittel gemieden werden. Click the picture for some lecture notes!! The nautilus is a cephalopod mollusc related to the octopus and squid. Unlike its relatives, the nautilus resides in a beautiful chambered shell. The animal's appearance is bizarre in a very appealing way. In some respects it can be considered a living fossil, the last of its kind, surviving from the ancient seas of Earth. 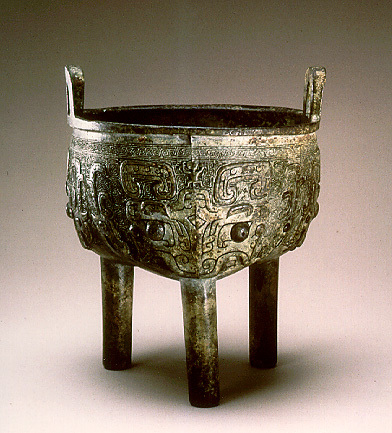 The taotie appears on artifacts from ancient China such as the one shown here on a bronze urn. Depending on the software you use to view Chinese the accented "n" may not display properly. This is a phonetic transliteration from English (actually Spanish) into Chinese, and in this case the characters' meanings are not really that significant (except the first, e4, which means "distressed, in difficulty). I found this word in an article in Mingbao newspaper describing recent storms in Southern California as perhaps being an effect of el Ni�o.